Phoebe: All right, it seems pretty simple. Your first line is “My name is Claude”, so, just repeat after me. “Je m’appelle Claude”. Phoebe: Well, just… let’s try it again. Phoebe: Uh. It’s not… quite what I’m saying. Phoebe: All right, let’s just try it again. Really listen. 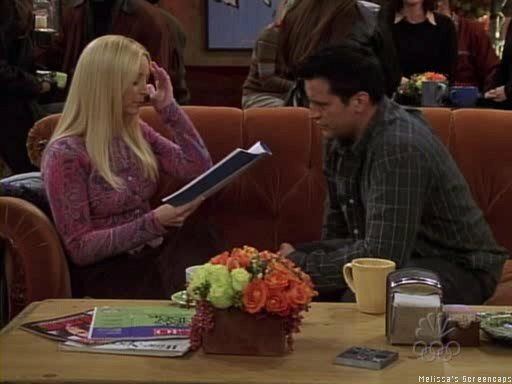 Phoebe: (slowly) Je m’appelle Claude. Phoebe: Noooo! Ok, maybe if we just break it down. Ok, let’s try at one syllable at a time. Ok? So repeat after me. “je”. Phoebe: Ok, it’s too hard, I can’t teach you! Joey: (he goes out calling her) Don’t move! Don’t go! I need you! My audition is tomorrow! Shah blue blah! Me lah peeh! Ombrah! (he gives up). Pooh. You woman, made me happy. and yes, your profile matches my taste…especially calvin…my favourite line from Calvin and hobbes_tiger food!! Happened to tead this post now..brought a smile back, proving to be a rarity these days..hope you’re doing fine..
Oh I love friends ! Any recap on friends is always welcome !